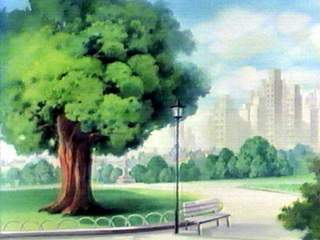 Everybody knows that the Rescue Rangers live in a big oak tree, which grows in Central Park in New York (we don't know exactly in which tree), quite the contrary of 5th Police Station. The tree looks like a normal oak tree, except for some windows and two landing strips, which are best seen at night. While watching the series, I found out, the HQ has 11 rooms, including the hangar. They are dispersed on 3 floors. Since these floors are not placed as usual, I won't number them. The floor with the conference room I will call "main". Upper floor will be "upper" and lower floor will be "lower". Below is a list of rooms, sorted by floors. The rooms boundaries are very relative. The blue vector indicates direction to the main front door. The most difficult thing was to determine the positional relationship of the rooms, to draw a plan of a single room is much easier. Only the locations of the conference room, the workshop, the hangar, the kitchen, the undefined room and the gymnasium was determined most accurately. The locations of the Chip and Dale's bedroom is determined approximately. And the locations of Gadget's and Monty's bedrooms is determined very roughly. The bathroom was mentioned only once, in the episode "Parental Discretion Retired" (#08). We learn about it from Monty (to the left, beside the second bull's-eye). The location of Zipper's room also is not known, so it isn't present on the map. I know about two bedrooms at the upper floor, but I couldn't find out which is Monty's and which is Gadget's. The corridors locations was determined mostly instinctively, guided by doorways and room locations. Besides Disney's animators sometimes "changed" the locations of the doorways and corridors. (I doubt that Rescue Rangers rebuild them, I guess it is animator's mistakes).